Product prices and availability are accurate as of 2019-04-18 23:41:03 UTC and are subject to change. Any price and availability information displayed on http://www.amazon.com/ at the time of purchase will apply to the purchase of this product. Keep your wine in the perfect enviornment with the Wine Enthusiast silent double door dual zone wine refrigerator Slimline Edition. 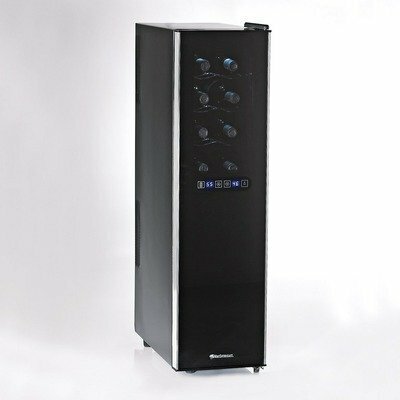 This wine cooler will help protect the taste of your red and white wines, with virtually silent cooling technology in two separate compartments. The stainless steel door offers a sleek, modern design perfect for the décor of any home, while the push button controls allow for easy maintenance and easy temperature control. 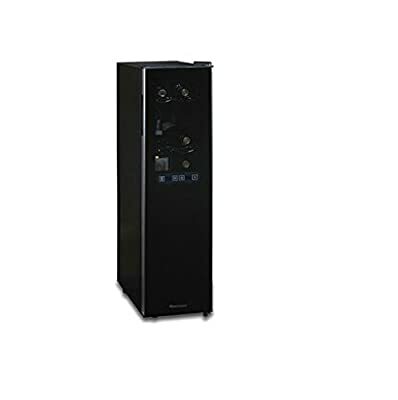 The top zone adjustable temperature range is from 54 to 66 degrees F, while the bottom zone adjustable temperature range is from 46 to 66 degrees F. The thermopane glass door features a pull handle and lock, and the interior LED lighting allows you to easily illuminate your wine collection. This piece also features seven pull-out chrome shelves meant to hold standard Bordeaux size bottles, that can also be removed to accommodate larger bottles. This model is not meant to be built-in to cabinetry, recessed, put underneath a counter, or used in an enclosed area. While the back of the unit does produce a minimal amount of heat, it still needs to vent to an open area. A thermoelectric, energy-efficient, CFC-free wine cooler. ETL approved. Two zones: top holds 10 bottles, bottom holds 8. 7 pull-out chrome shelves. Exterior digital touchscreen with temperature display Touch Screen Top Zone adjustable temperature range of 54-66°F provides ideal storing conditions for reds and whites Touch Screen Bottom Zone adjustable temperature range of 46-66°F provides ideal storing conditions for reds and whites, and optimum serving conditions for most whites Exterior digital touchscreen with temperature display 18-bottle capacity***Note: Shelving is meant to hold standard Bordeaux size bottles, using larger size bottles may limit the capacity. If you would like to store larger bottles you can easily remove any of the shelves. This will also prevent scraping the labels on the larger bottles.